It has been so cold the last couple of weeks that I thought it was time for a warm neck cozy pattern. Because it buttons to fasten around your neck, this snuggly short scarf takes less yarn than a full size scarf. Just a little under 315 yards of worsted weight yarn. I used Caron Yarns “Simply Soft” for the sample you see. 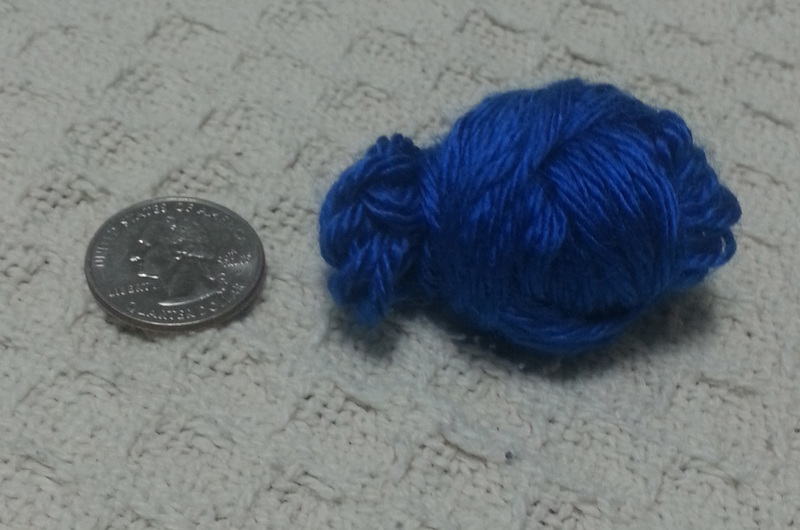 This is all I had left of the 1 skein I used. That is a U.S. Quarter next to it to give you a frame of reference. Neck Cozy is 13.25”/ 33.125cm wide (lace scarf section) x 30”/ 75cm long. Shell Stitch (Shl): (3 dc, ch 2, 3 dc) in indicated st or sp. V-stitch (V-st): (dc, ch 2, dc) in indicated st or sp. Picot stitch (picot): Ch 3, sl st in top of previous st. 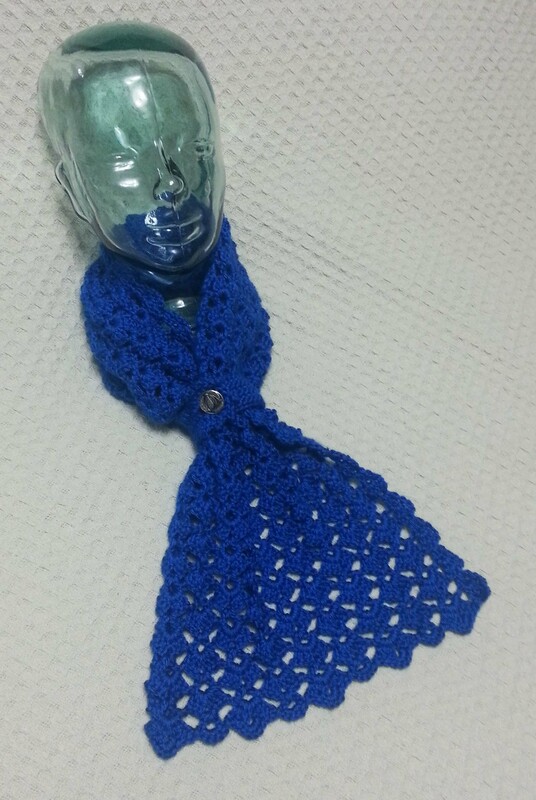 This Neck Cozy is worked in 2 parts, the Button Band and the Lace Scarf. 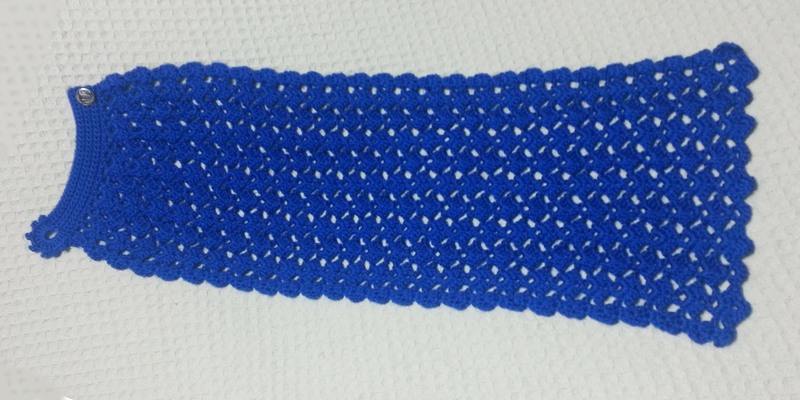 Be sure to work the base chain loosely for ease of working into the bottom of the foundation row when crocheting the lace scarf part of project. If having problems keeping the chain loose enough, use a hook one size larger to make the chain then switch to the smaller hook for the rest of the project. When counting stitches for skipping, chain stitches count as one stitch each. Rows 5 & 6: Repeat Row 2 twice. Row 7: Ch 1, turn, sc in next 31 sts, (button loop finishing) picot, [(2 dc, picot) 6 times, 2 dc] into ch-7 loop, sl st to end of Row 1. DO NOT Fasten off. Rows 5 – 50: Alternate repeating Rows 3 & 4, 22 times. Sew button to RS of button band on Row 4 at opposite end from button loop. « Checking off one of my 2017 Resolutions! Is there a print friendly version for this pattern? I don’t have a print-friendly button, but you can copy the URL then go to https://www.printfriendly.com/ and enter it in the box at the top of the page that says, “Make any web-site print friendly.” Hope that helps. Beautiful pattern nicely written. Can’t wait to start the project. Thank you.